The Queen Elizabeth Class HMS Malaya was a veteran of the First World War, sustaining and surviving 8 hits during the Battle of Jutland 1916. Between wars in 1922 she was tasked with carrying the last Sultan of Turkey, Mohammed VI, from Istanbul into exile. During the Second World War she was initally based in the eastern Mediterranean before being assigned to Force H, based in Gibraltar, at the end of 1940. In March 1941 she once again sustained damage, torpedoed by German U-boat U106. This battleship was eventually retired from active service in 1944 and scrapped in 1948. Incidentally the ship's bell can be seen in London's East India Club. 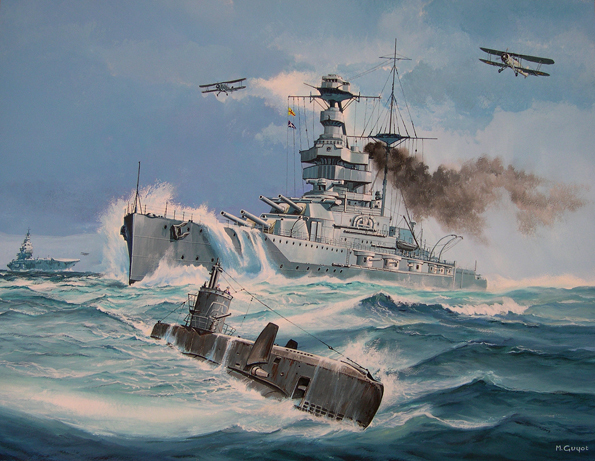 In this painting HMS Malaya is being escorted by a British S-Class submarine as part of the naval task Force H.